Seaside, Oregon: A Place of Discovery and Adventure - Seaside, Oregon is home to one of the Pacific Northwest's best beach house locations. With a beach known for excellent surfing, combined with the charm of a 1920's promenade, it's no wonder that this resort town is such a popular destination. And when you visit Seaside, you are able to step back into history and follow in the footsteps of the great explorers Lewis and Clark. At the beach at Seaside, you can discover the past and create your own adventures. Learn more here! Listed below are other beach properties within a 50 mile radius of zip code 97138. Welcome to Seahorse Cottage in Seaside! This beautiful and quaint cottage has room for up to six guests, with two bedrooms and one bathroom. You can even bring along your favorite four legged friend! Enjoy this 4 bedroom home moments from the sand in Seaside! Seaside, Oregon: A Place of Discovery and Adventure - Seaside, Oregon is home to one of the Pacific Northwest's best beach house locations. With a beach known for excellent surfing, combined with the charm of a 1920's promenade, it's no wonder that this resort town is such a popular destination. And when you visit Seaside, you are able to step back into history and follow in the footsteps of the great explorers Lewis and Clark. At the beach at Seaside, you can discover the past and create your own adventures. Seaside's promenade-the Prom-is one of Oregon's most famous landmarks. Stretching along a mile and a half of the shore, this boardwalk is the perfect place to enjoy gorgeous views of the Pacific Ocean, as well as Tillamook Head covered in lush rainforest. The whole family will enjoy the nearby Seaside Aquarium, where you can feed seals. A variety of dining options will satisfy any appetite, whether you are craving street food, seafood, bar food, or international cuisine. In the center of the Prom you will find the Turnaround, which is the official end of the Lewis and Clark Trail. Here stands a bronze statue of Meriwether Lewis, William Clark, and Lewis's dog, Seaman, commemorating their groundbreaking journey from Saint Louis to the Pacific. Step off the Prom and onto the wide, sandy beach to enjoy a picnic, a game of fetch with your dog, or some time on the playground with the kids. The lucky residents of Seaside, Oregon beach property get to enjoy some of the best surfing in the Northwest, and local shops can outfit you with everything you need for skim boarding, kite boarding, longboarding, or kayaking, as well as offer advice on the best spots for your skill level. For more peaceful water recreation, take your kayak down the Necanicum River and observe the local wildlife. 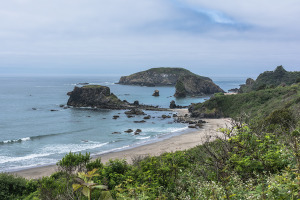 Ecola State Park, to the south of your Seaside beach property, is a favorite of both Seaside's local residents and seasonal visitors. Park visitors can go hiking, explore tide pools, surf, and watch for wildlife like bald eagles. This park is also the starting place for a favorite tradition-following the trail of Lewis and Clark. If you travel the Tillamook Head National Recreation Trail for 12 miles up into Seaside to the Turnaround, you will have successfully walked through history. When the exploration party traveled up Tillamook Head 1806, Clark declared the view to be ". . . the grandest and most pleasing prospects which my eyes ever surveyed. . ." And that's saying a lot since he had seen a lot of magnificent countrysides on his 4000-mile journey. As you look out from your vantage point on the trail, be on the lookout for migrating gray whales. You also won't want to miss seeing "Terrible Tilly," or the Tillamook Rock Lighthouse, which is rumored to be haunted. If you're looking for beachfront property in the Pacific Northwest, look no further than Seaside, Oregon. 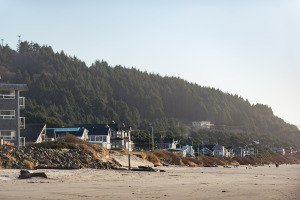 With the dual appeal of excellent outdoor recreation and historic sites, an Oregon beach house property is the perfect place to call home, even if you're just visiting.